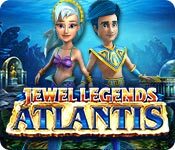 Jewel Legends: Atlantis is rated 3.7 out of 5 by 27. Rated 5 out of 5 by yelwbkrd35 from Terrific! M3's need certain elements done right so they continue to be fun. This game has them. Good Power ups, music, sound effects. Building and buying are part of this game. I think the visuals are the best I have seen in quite some time. Worth the price or credit, in my case. Tanx BF been a while since we have had such a fun game as this one. Rated 5 out of 5 by donadriedger from How cute is this? I thoroughly enjoyed this game...so adorable!! There are 140 levels and yes, it is repetitive..but so what?..most M3 games are. It is completely relaxing, if you play on the untimed mode. It could be very challenging if you play the timed method, as there is a lot of stuff blowing up and obscuring the screen all the time. You are rebuilding Atlantis and have amusing areas to create, such as the Clam Farm, where the clams are planted in the fields. You can earn upgrades for each power item that you buy and there are bombs and squids when you make matches of 4 or more (the squids make ink, which I got such a kick out of, that I made them do it all the time). But...the absolute best part is the ambient sound...burbling and clinking, with a little tin whistle going on in the background...Loved it! You get the blueprints for each area by playing a mini game, which is not very different from the M3 game itself, but is cute, nevertheless. I had every intention of trying the other modes, but the time went so fast, darn it! Anyway, this is my kind of M3 and I can see myself at it for many hours...oh, oh, there goes the housework! Rated 5 out of 5 by millymolly80 from GREAT MATCH 3 Love it!!! 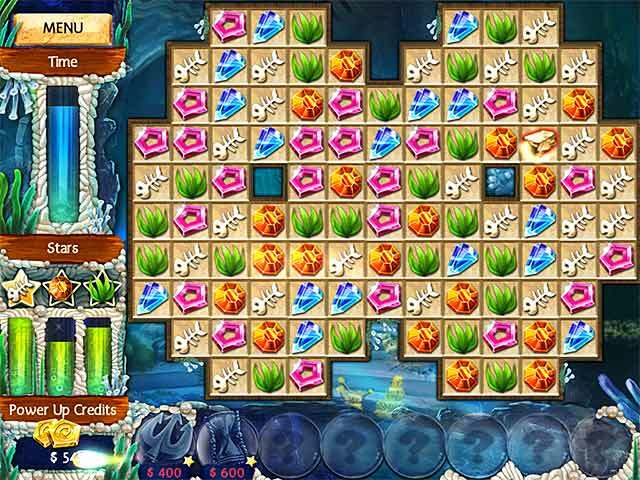 Great match 3 game , great graphics.I love these traditional match 3 where you drag and drop.Gorgeous scenes. Also you can play in zen mode as well. Hope we get more like this. Rated 5 out of 5 by romany09 from Already a fan! 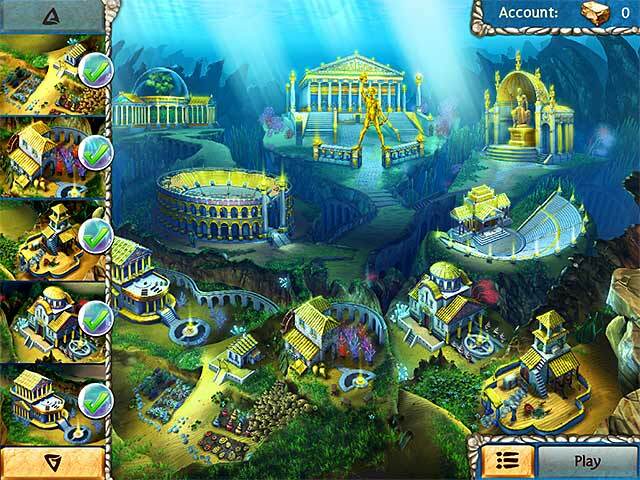 I'm a fan of the previous game (Tree of Life) and own the PC and Kindle Fire versions so was glad to beta Atlantis. There are 140 levels with modes; I chose Adventure. I started out in the timed mode but decided I wanted to relax and enjoy my coffee this morning so switched to Zen without losing anything of my previous game. Also, Zen and Timed are the same: lots of power ups, progressively challenging, and all-around fun. The music was nice and I usually turn off the sounds but didn't mind the "pows" in this game. The graphics are pretty and there is a bonus game every once in a while to help toward building. If you like Match 3 games and you're tired of the insipid social media ones that do nothing but cost you money (LOL), please try this game! 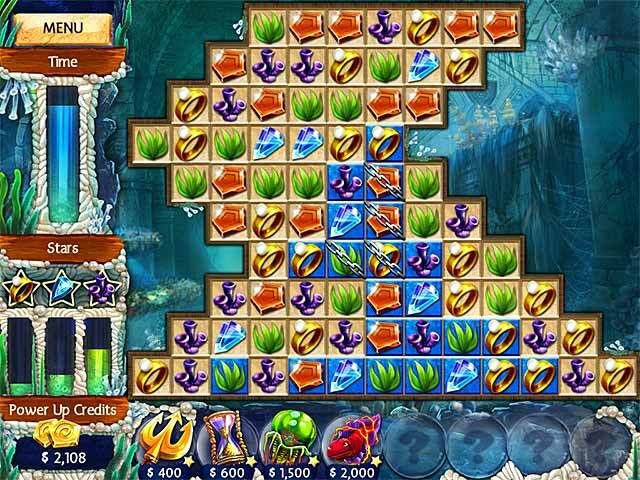 Rated 5 out of 5 by couponfowell from Challenging or Zen I was excited to see that this game is very similar to Jewel Legends Tree of Life. Tree of Life has been my go to match 3 game for quite awhile. Atlantis has a cute story, but I'm not much of a story girl. What makes the game special is the grafics, the power ups, and for me the challenging timer. This game has a few goals to work at all at once, which along with the colors and changing tiles makes it fun. Tree of life had over 100 levels I expect this one does as well. It also has different modes of play. I was so happy to find a fun match 3 again that I am writing my first review! Rated 4 out of 5 by fredandethel from Really pretty and rather different I notice one reviewer thought the graphics too bright but the main reason I bought this was the design, and particularly the large variety, of the tiles. I found myself wanting to see which ones would be in the next level. Rated 4 out of 5 by nelliebj from Another Jewel Legend! I only played half of the demo and bought the game. I already have Tree of Life and enjoyed that. Even though the developers really like to make you work hard!! I love building cities/buildings during an M3 game but you sure have to work hard to earn enough gold to get to each building. And the upgrades! But it's lots of fun, easy going (in the untimed method) and a game you can play an hour or so, go back to it later and still enjoy every minute. It's not as easy as one might think. Lots of chained up squares to get through. And it gets more difficult as you go on. Worth every minute! Definitely recommend this game.